I discuss applications of non-traditional aerial photography to surveying, including close-range photogrammetry performed from an aircraft for projects such as buildings, stock piles, cliff faces, accident scenes, or other inaccessible or unusual sites. Additionally, I briefly review the use of light aircraft and low-cost, non-metric cameras, which might be applicable to some surveying and GIS projects. The term “metric,” when applied to aerial cameras, generally means cameras designed and built to be used for photogrammetric work. However, the actual camera properties referred to as metric include generally having consistent and repeatable geometric properties, such as principal point and lens-distortion characteristics, that enable precise and repeatable measurement using the images taken with the camera. 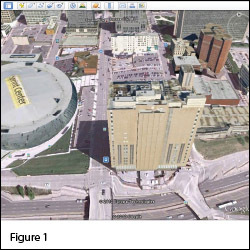 Bob Williams presented a helpful comparison of small- versus large-format aerial photogrammetry in the May 2009 issue of this publication. Most “large format” cameras used in aerial photogrammetry are metric by design, even if they are actually pushbroom scanners (such as the Leica ADS series) or an array of small- or medium-format CCDs and independent lenses in a multi-head design (such as the Intergraph DMC and Microsoft/Vexcel). However, medium-format aerial cameras exhibit a diverse heritage with only a few expressly designed to be metric; most are consumer cameras adapted to metric aerial photogrammetry applications (such as the Contax 645 in the original Applanix DSS). Small-format cameras are almost always of consumer origin, but these too can be adapted to quantitative metric use in aerial photogrammetry (such as Pictometry’s USGS calibration using originally consumer-grade, small-format cameras). So, in the medium- and small-format world especially there is a grey area in terms of metric aerial photogrammetric usage. Realistically, your goals in using the imagery should drive your choice of sensor and platform. Those projects requiring tight specifications on accuracy may be best served using USGS or industry-recognized and calibrated equipment, and those projects that might need the imagery for utility purposes or have less-restrictive accuracy requirements may benefit from less costly sensor systems. downtown Kansas City (Figure 3). Scrolling through oblique imagery is handled nicely with smooth transitions to the next frame. Many geospatially oriented people have dabbled with viewing oblique aerial imagery. The widespread commercialization of oblique aerial imagery by Pictometry and licensing with Microsoft in its publically available Bing “Birds Eye” view maps have made it quite prevalent, and now Google is getting into the game as well via its Maps and Earth tools sporting oblique imagery (Figure 1). This free imagery is great for scoping out project sites and getting an alternative perspective compared to vertical imagery. This free oblique imagery has quite limited coverage, even in the United States. So if you find it valuable for your clients, use it, but if it is not available or of inadequate resolution, you can quickly and quite economically hire a local aerial photographer to collect it, along with verticals for non-surveying purposes. Figure 2 shows a publically available example of Google’s “building maker” web application. The user can select sites in Google’s imagery, and, if oblique coverage exists for those sites, the user can measure and model three dimensional structures using Google’s version of oblique photogrammetry. Google’s application does not afford any high degree of geometric accuracy; for that you need to undertake a more rigorous approach to oblique photogrammetry, generally called close-range photogrammetry (CRP) (even if it is not applied at close range). Close-range photogrammetry simply applies photogrammetric techniques to multiple images taken viewing a common target, at any scale or object-viewing distance. In a close-range photogrammetry project, the site would be photographed from multiple viewing angles and camera orientations using a conventional camera (similar to the Google Building Maker scenes in Figure 2). The subsequent images would be downloaded to a computer, and common points identifiable in multiple images would be selected either manually or automatically. The three-dimensional points can then be retained as points or connected by lines and surfaces and imported into CAD, GIS, or spreadsheet software. Some software is able to “scan” the imagery and create a 3D point cloud or grid of the scene much like a laser scan. Close-range photogrammetry can be undertaken from an aerial platform, such as an aircraft or a helicopter, to survey or surface scan areas that may not be amenable to conventional ground-based techniques or for which airborne laser scanning or aerial photogrammetry might not be cost effective. Target areas such as swamps, large buildings or structures, cliff faces, or stock piles are examples of sites that might be ideal CRP survey projects. The vast bulk of CRP is not done from aircraft but is ground-based or even microscopically based, so the aerial approach is uncommon. The most accurate results are achieved using higher resolution cameras, such as a DSLR camera, with normal- to wide-angle prime lenses (non-zoom) that have the focus fixed during acquisition and are calibrated using the included software before or after the shoot. Prices for a good quality DSLR camera and CRP software start around $1,000 for each. Accuracies for CRP undertaken with decent equipment are on the order of 1:20,000 and are scale dependent, unlike GPS ground surveying. Some examples of sweet-spot applications of airborne CRP are inaccessible sites, non-horizontal sites, or small objects or areas such as cliff faces, stock piles, buildings, or accident scenes. You can use airborne CRP also for sites where aerial photogrammetry/lidar service is not cost effective, such as international projects and remote or small ones. One can take several approaches to coordinating a close-range aerial photogrammetry project, including contracting it out fully, hiring the photographic collection, and doing the processing oneself. In fact, you can do it all yourself if you have aerial photo skills. Close-range photogrammetry requires a substantial learning curve, especially airborne CRP. You must make a considerable time investment in learning the software and achieving good results. Developing this expertise is feasible only in order to develop a new service offering rather than for a single project. However, in pursuing this approach for airborne work, you would either need to partner with a local aerial photographer (who should be able to collect imagery for a few hundred dollars per site), or you would develop the aerial photographic skills and have access to an aircraft, such as from a local flight school, rental company, or flying club. For a single project, a more realistic approach would be to contract it out to someone experienced in its performance. This approach would entail working with a CRP professional to set up the project, where you would generally survey a few reference targets visible in the scene, and the CRP professional would collect the photography and process the imagery, working with you to specify the scene targets and output formats. Oblique aerial photography can be applied to solve a variety of surveying and measuring challenges. Free web-based applications such as Microsoft Bing Maps and Google Maps provide considerable U.S. imagery coverage for spec’ing out projects, and local aerial photographers can provide aerial imagery where these providers are limited and where higher resolution is needed. Close-range photogrammetry using oblique aerial imagery can often be used for high-precision measurement, modeling, and topographic scanning on sites such as stock piles, buildings, cliff faces, as-builts, and accident scenes when other methods are problematic or cost-prohibitive. Cliff Gill is president of Airborne Scientific Inc., providing aerial photography services, products, and consulting from Kansas and Alaska.